Under the Every Student Succeeds Act (ESSA) of 2015, states have considerably more flexibility and authority in K-12 education than they had under the previous federal education law, No Child Left Behind (NCLB). The Trump administration and the Republican Congress, meanwhile, moved in 2017 to further loosen federal accountability rules and give states even more control over their school systems. With this increased power for states comes the increased responsibility to support the improvement of educational outcomes for every student. Leaders at the helm of state education agencies (SEAs) find themselves in a moment of both great change and great opportunity, as many agencies move away from a predominant focus on compliance with federal regulations and programmatically dictated uses of funds, and toward a broader focus on supporting districts and schools. For many advocates of low-performing students, it is also a moment of potential peril if states fail to embrace their new responsibilities or weaken their commitment to improving educational opportunity and outcomes. Joanne Weiss; and Patrick McGuinn (2017). 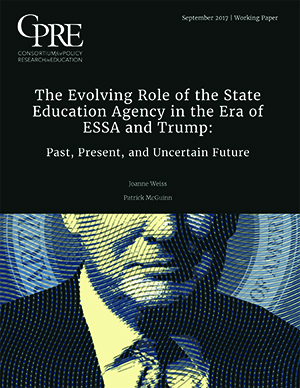 The Evolving Role of the State Education Agency in the Era of ESSA and Trump; Past, Present, and Uncertain Future . CPRE Working Paperss.